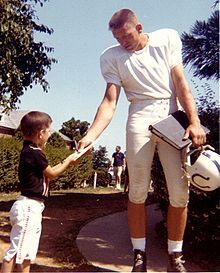 Unitas signing an autograph in 1964. John Constantine "Johnny" Unitas (May 7, 1933 – September 11, 2002, often called "Johnny U. "), was a professional American football player in the 1950s through the 1970s. He was a record-setting quarterback and the National Football League's most valuable player in 1959, 1964 and 1967. His record of throwing a touchdown pass in 47 consecutive games (between 1956-1960) is unrivaled. Unitas is commonly considered the greatest quarterback of all-time. He spent his first and last seasons each with the Pittsburgh Steelers and San Diego Chargers. He is most famous for his time with the Baltimore Colts. He was part of what some considered "The Greatest Game ever Played," in 1959. Unitas handed a ball to Alan Ameche, who scored against the New York Giants. The Colts eventually moved from Baltimore to Indianapolis in 1984. Unitas supported the Baltimore Ravens and is part of their Ring of Honor (Inducted 2002). Unitas's grave in Timonium, Maryland, USA. ↑ Hall of Fame QB Unitas Sports Illustrated.com. This page was last changed on 26 October 2017, at 02:17.